All Powell instruments feature a lifetime warranty on any solder joint. In addition, Powell warrants that your instrument will be free of manufacturing defects for the initial 12 months from the date of purchase. This warranty does not cover damage to your instrument caused by normal use and wear and tear, or resulting from misuse, improper care, accidents, or unauthorized repair or service. In addition, this warranty does not cover adjustments such as shimming of key pads, adjustment of keys, adjustment of key motion (including binding), and adjustment of headjoint fits. The warranty is restricted to the original owner. If you purchased a wooden Powell instrument, Powell warrants that it will be free of manufacturing defects, including cracks, for the first 12 months from the date of purchase. Nearly all cracks are repairable. Powell shall, at its option, repair the crack or replace the defective part at no cost. One very important part to note is that of "damage caused by unauthorized repair or service," because this would void the warranty. But what does this mean? Well, the question came up recently, so we thought we would check in with our repair department to clarify. The nice thing about Powell is that the company has a good relationship with its authorized dealers, and the repair technicians at our dealers' shops are authorized to work on Powell instruments. 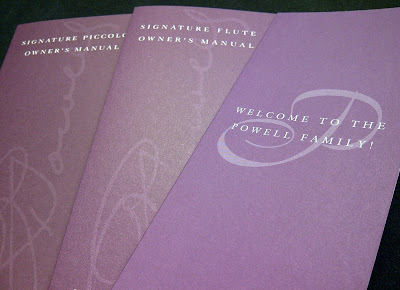 Dealers who carry Powell are familiar with the parts used on Powell flutes and the general mechanics and design of the instrument. If you were to take your Powell to a repair shop that does not carry Powell, the repair department may not be familiar with the parts and may not have them. In that particular case, something could be damaged in the repair process, and then the warranty would be voided. So, it is important to stick with your authorized Powell dealer (and their authorized repair techs) if you have a question or need service. If you purchased your Powell directly from the company in Massachusetts, make sure to call the company to schedule repair. Authorized Powell technicians will be familiar with your flute and will be able to repair it with the care and expertise your flute deserves!